It’s been many years since I first came across James Monti’s voluminous Week of Salvation: History and Traditions of Holy Week. I was still a student at Ave Maria College back when it was still in Michigan—the real Ave as us small band of brothers sometimes call it—when someone gifted me this book for Lent. I remember spending hours poring through it in the college library and common room, learning for the first time, as a relatively new practicing Catholic, about the rich history of Holy Week. Monti’s book goes through Holy Week day by day examining the history and customs surrounding each. The breadth of his study is very exhaustive; chapters typically begin with an exegesis on the relevant biblical passages and then go on to examine the patristic writings, drawing on such rich and diverse sources as St. Cyrl’s Catechetical Lectures, fragments of ancient liturgies, and the diary of the pilgrim Egeria. They frequently discuss early medieval liturgical sources, including those outside the Latin rite, such as the liturgies of the Mozarbic rite and the Chaldeans. It also covers monastic usages during and after the Cistercian reform and draws on early modern travelers’ journals for its narratives of various celebrations in the 17th-18th centuries. It typically concludes each chapter with a section on how various Holy Week celebrations are conducted in the post-Conciliar era. Following Mass at the Chapel Royal, the king and queen would proceed to the Hall of Columns. Arriving there at two o'clock in the afternoon, the king (Alfonso XII) entered in full ceremonial uniform, decked with all his medals of state, together with his queen (Maria Christina), who was dressed in a fine down and flowing train, with a white mantilla and a diamond diadem on her head. In the center of the hall stood two platforms; on one twelve poor elderly men were seated, clothed in new suits provided by the king; on the other platform were twelve elderly women, likewise dressed in new clothing provided by the queen. Nearby stood an altar on which was placed a crucifix and two lighted candles. The bishop, who was Patriarch of the Indies, then went before this altar and read St. John's gospel account of Christ washing the feet of His disciples at the Last Supper. Following the reading, a small gold-fringed embroidered band was tied around the king's waist, symbolizing the towel that Christ tied around His waist on this occasion. The king now mounted the first platform, accompanied by his steward, who brought a golden basin and ewer [jug]. He then knelt down before each of the men seated there and poured water over their feet, wiped them, and kissed them. Reading about how the monarch’s family used to be integrated into the celebrations of Holy Week really helped flesh out in my mind what the civic culture used to be like in Catholic confessional states—and what was lost when such kingdoms passed away. I don’t know whatever happened to James Monti. Week of Salvation was published back in 1993 and I am not aware of any other titles by this author, which is unfortunate since this was such a helpful and exhaustive study. The writing style is not always the most engaging; it sometimes feels like reading a dry historical chronicle. If you’re very interested in reading cultural histories, you might enjoy this. But it’s not very engaging for casual reading. You really need to set out with the intention of making it an occasion for serious scholarly study to enjoy the book. Still, if that’s not a problem, I definitely recommend this book. I plan on revisiting some key chapters next week as part of my preparations for the Holy Triduum. Incidentally, though this book was originally published by Our Sunday Visitor, it no longer appears in their catalog. The only copies available are used editions. May you all be blessed in your preparation for Easter. 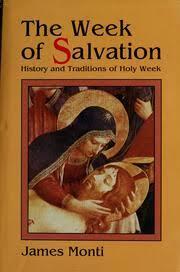 Click here to purchase James Monti's Week of Salvation: History and Traditions of Holy Week. Mr. Monti is doing very well. He has dedicated his time to assisting at the library of St. Joseph's Seminary. In particular, he has begun to revivify the rare books collection. He is also a regular contributor to the Wanderer, and is now working on a project regarding the life of Venerable Edel Mary Quinn. St. Patrick was not named "Maewyn Succat"